When Mike Conners of Kenwood Construction Services, Incorporated, bought a foreclosed house in the Hyde Park neighborhood of Chicago, it was in pretty bad shape—and now it’s a net zero building. The basement fieldstone foundation walls were not properly waterproofed and had substandard footings. The upper-floor brick walls had pronounced efflorescence and spalling, plus numerous cracks and holes. Many of the floor and roof joists were seriously compromised from aging and multiple renovations over the years. Thermal investigation revealed several bulk water penetrations. Interior humidity levels typically exceeded 75%. A mildew smell permeated the entire structure, despite the 17 ACH50 natural infiltration rate. Over the next few years, Conners and his team revived this approximately 17-foot-wide, 1880s Greystone row house into a comfortable, energy-efficient Passive House. They gutted the interior to the brick, rebuilt the foundation, repaired the stone and brick walls, added 1,000 square feet of living space in the back, and topped the structure with a 200-ft2 penthouse utility room plus terrace. The reconstituted 3,500-ft2 four-story-plus- basement residence includes five bedrooms and three bathrooms. It has enough roof space to host up to an 8-kW grid-tied PV system that should provide enough site-based electricity to make the house net zero. To structurally revitalize the house, Kenwood Construction tore out the old basement slab, excavated under the existing foundation in 6-ft sections, and placed new footings. Then several dozen cubic yards of sand were removed from the slab area, resulting in a finished ceiling height of 8 feet 5 inches, increased from six feet 8 inches. Seven inches of Type IX EPS were topped with a new 4-inch slab. The below-grade stone walls were repointed and covered on the outside with a dimpled rain screen and rigid mineral wool before backfilling. Parts of the above-grade brickwork were replaced or repointed and parged. Once the walls were repaired, the side- and rear-wall exteriors were covered with a mix of insulation types, a vapor control membrane, and cladding. The classic limestone front façade, typical of Greystone buildings, was power washed and repointed. An equal amount of work was done on the interior. The masonry walls, mortared with limestone plaster, were in disrepair. Lime plaster was applied to the surface of all the interior walls. This not only structurally reinforced them, but also created a vapor-permeable air-and-water barrier. 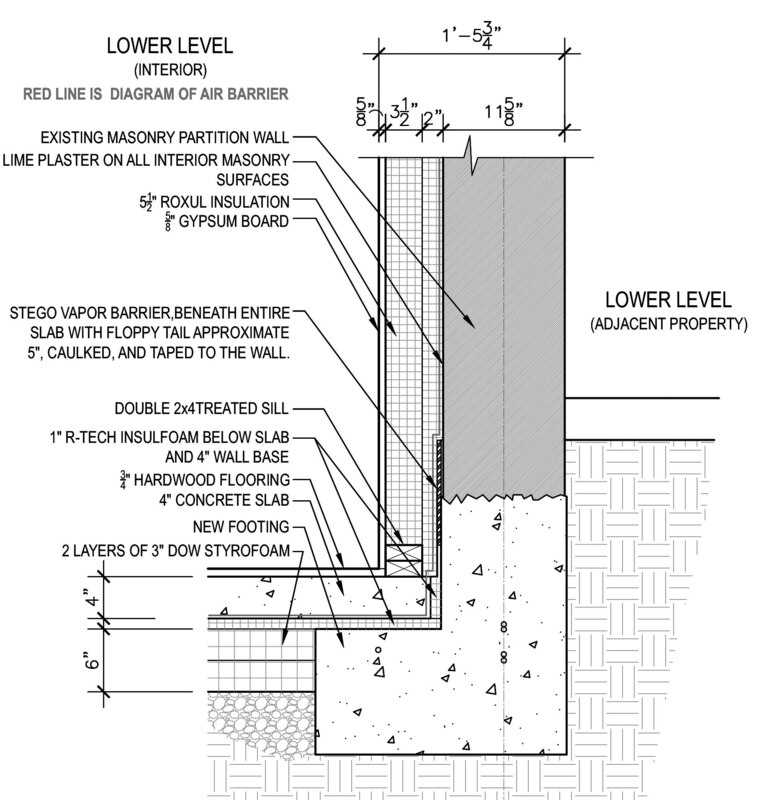 An intelligent vapor control membrane was then layered on top of all the interior walls. Some walls were finished with 1-½ inches of rigid mineral wool, for a thermal break, topped with 2 x 4 framing and batt insulation. Others were framed with 2 x 4 lumber offset from the masonry, providing a thermal break, and the cavities were filled with dense-packed cellulose. The damaged roof deck had to be removed in its entirety. It was replaced with a 7-inch layer of insulation sandwiched between 1-inch plywood layers, structurally supported by 10-inch LVLs filled with blown-in cellulose. Many of the joists between floors also had to be replaced. Wedged into pockets in the masonry walls, they were all taped at the wall junctions, prior to the addition of the interior insulation, to tie into the air-and-water barrier. Mechanical systems and interior materials were picked to maximize indoor air and water quality. A multizone ductless mini-split provides heating and cooling. There is a separate dehumidification system to handle those days when Chicago’s humidity is extremely high. A heat pump water heater provides domestic hot water. There is a whole-house water filtration system. According to Connors, the antimicrobial photocatalytic bath tiles kill a variety of microorganisms, are self-cleaning, reduce mold formation, and assist in breaking down volatile organic compounds. The drywall used throughout the house is designed to absorb and neutralize formaldehyde. In addition to pursuing Passive House certification, the project team paid equal attention to the carbon footprint and greenhouse gas production of the project. It sourced local materials whenever possible. For instance, realizing that most hardwood floor products are made from North American hardwoods that are shipped to China for finishing and then shipped back to the United States, the team located an urban-forest mill that sources felled hardwood trees from local park districts and arborists. The mill supplied rough-sawn white oak that was finished into tongue-and-groove hardwood flooring. The project’s extensive Web site (www.kenwoodpassivhaus.com) has a detailed breakdown of utility costs and greenhouse gas emissions for potential buyers of this spec house. The calculations show that, while a typical Chicago house produces over 95,000 pounds of carbon a year, this all-electric house should produce approximately 9,500 pounds a year, including charging an electric vehicle. Based on normal utility rates, the monthly utility cost should drop from $350 to $44. If the homeowners decide to install the optional solar PV system, they can reduce both their utility costs and carbon emissions to zero—transforming their home into a net zero building.